I am delighted to welcome you all to the 2012 Icebreakers Annual Reception. Let me first offer my warmest congratulations to those who are going to receive 48 Group Club awards this evening. There will be an Icebreaker Award and there will be Fellowships and Honorary Memberships awarded. 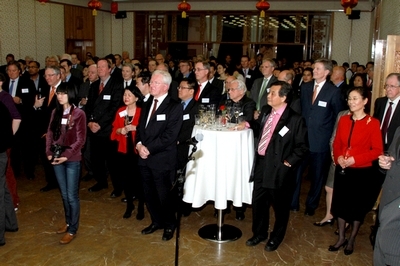 Since 2005, the Chinese Embassy has hosted the annual Icebreaker reception. That is now for seven years in a row. These seven years have witnessed continued positive progress in China-UK relations. These seven years also saw a deepening of China-UK cooperation. For many reasons, this year is another milestone in China-UK relations. It is a milestone where we can build on the past and work for the future. I am optimistic about China-UK relations for several reasons. First, this year marks 40 years of full diplomatic relations between China and the UK. Over the past four decades, the world has gone through dramatic changes. Our relations kept moving forward despite some ups and downs. l Our comprehensive strategic relationship has become more mature. l Our cooperation has increased in scope and in quality. Looking ahead, I am confident that China-UK relations have great potential and broad prospects. My second reason for optimism is this year has seen further improvements in our cooperation mechanisms. A latest example is the people-to-people dialogue. It was newly launched last week. This new dialogue is one of three important pillars in our relations. The others are the economic and financial dialogue and the strategic dialogue. Growth of our economic ties is impressive, in particular Chinese investments in the UK. CIC's single investment in Thames Water exceeds the total of Chinese investments in the UK last year. China has been presented as the Market Focus at the London Book Fair. The ongoing UK Now programme in China is another telling story of China-UK cultural co-operation. The upcoming Olympic Games in London will draw our peoples ever closer to each other. The Icebreakers Chinese New Year Dinner was yet again a truly memorable event. 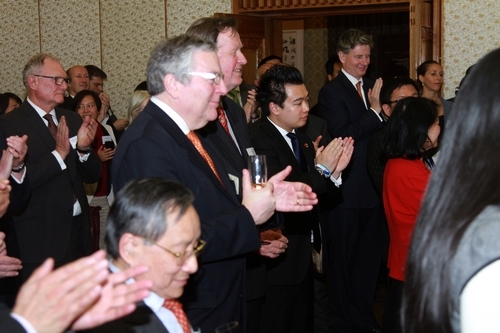 Many long-standing supporters of China-UK relations were present. During his visit to the UK, Mr. Li Changchun had a meeting with Stephen and representatives of Young Icebreakers. 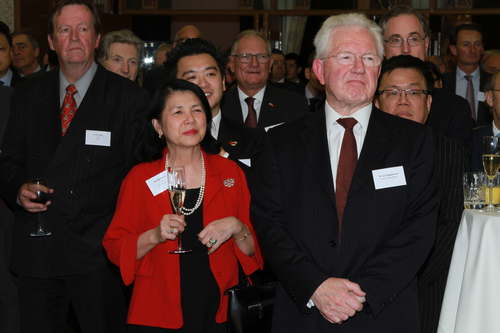 Yesterday, the 48 Group Club and All Party Parliamentary China Group jointly hosted a forum in the House of Lords. This created valuable discussions on public diplomacy and opportunities for Chinese and UK creative industries. The award winners this evening are from different sectors and backgrounds. I see political and business leaders, diplomats and military officers. Yet you have one thing in common. You have all done a superb interpretation of the 'icebreaker spirit.' The 20th century called for icebreakers. So does the 21st century. Sixty years ago, the 'icebreaker spirit' meant to break the ice and open the door of China-UK business relations. Sixty years on the responsibility of Icebreakers is to promote an all-dimensional development of China-UK relations. I have great expectations for you Icebreakers, because I believe there is an even greater role for you to play today. First, Icebreakers should be the ballast of China-UK relations. In today's world, governments are no longer the sole players in state-to-state relations. Traditional Chinese wisdom stresses the importance of following the people's will. Icebreakers today should also meet the common desire of our people. I encourage you to leverage your influence as NGOs or individuals to ensure stable growth of China-UK relations and avoid ups and downs. Here I want to acknowledge Chairman Stephen Perry for his distinguished service. As steersman of the 48 Group Club, he never wavered his commitment to China-UK relations all through the decades. Our relations need constant supporters like him. Help expand bilateral trade and investment. Promote financial and cultural cooperation. In this aspect, I appreciate the outstanding role of Mr. Zhang Jiangang, CEO of Huawei UK, who will be awarded Honorary Membership this evening. With his vision and determination, Huawei successfully acquired CIP recently. This deal has greatly built up Huawei's R&D capability in the UK. Deepen mutual understanding between our two peoples. Reduce and dissolve prejudices against China. Again, I want to commend some of the leading figures in bringing our two peoples ever closer. The Fellowship winner Duke of Westminster has made admirable efforts to increase exchanges between Chinese and British retired military officers. Another Fellowship winner Major-General Graeme Lamb tried to enlighten British public about China by his article in The Times after his visit to China, in which he warned against making China a new enemy and demonizing China. He also called on the West to talk to China as knowledge dispels fear. 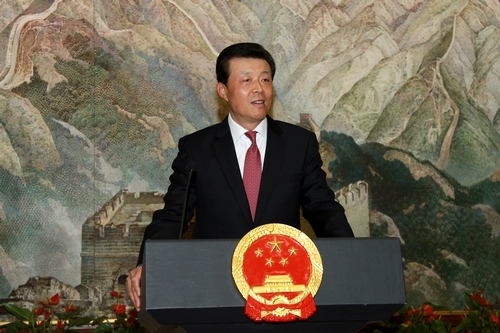 The Icebreaker winner Chairman Zhao Qizheng has spared no efforts to promote a better understating of China through cross-cultural dialogue. Chairman Zhao, your efforts are paying off. All in all, I do hope that our friends from the 48 Group Club will carry forward the 'icebreaker spirit', and keep up with the changing times. In turn this will enable Icebreakers to make an even greater contribution to China-UK relations.